So that's what pigeon shooting is!! I have written very little in these pages recently regarding my shooting exploits. There is a very good reason for this - there hasn't been anything to tell! I have found several pigeons, but have been unable to whisper to them. La bala's son Stuart shot 150 on a field of drilled wheat on Monday. Both had got in touch with Muncher to let him know that a lot of pigeons were still in the area and using the field. I wasn't surprised. I decided that I would go and shoot the field yesterday. 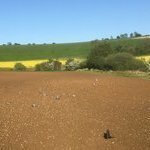 I arrived at around 9.30 am to see about 50 pigeons on the field, and some more joining. I set up further down from where Stuart had shot. I started with 20 flocked shells and a magnet. A small hide was erected in the shallow ditch. My set up worked ok to start with, adding the shot birds as I got them. Muncher turned up not long after 11am, by which time I had around 20 birds down. I always knew that the pigeons may be a bit shy, due to the bashing they had on Monday. This was very evident as the day progressed. Though many decoyed well, far more steered clear. Another magnet was added, then both taken down, to try to get the birds to co-operate. This didn't really have much of a positive effect. The double magnet approach seemed to be working best. We both took down some good birds, but chances for pairs rarely presented themselves. I was still enjoying it, as it was by far the best decoying foray of the year so far. We packed up at 4pm. We picked 130 pigeons, 2 jackdaws and a magpie. Hopefully Muncher will now add a picture! Nice report, good to see you boys back out amongst them. We had a long drive round yesterday, rivalling PC for miles covered, alas only 7 birds were put in the bag. But what a cracking day to be out. Good day and great report boys. Considering the field had been shot two days earlier you did great. I think if stu hadnt shot it you would have doubled it. The farmer will be well pleased. There is a little laugh over this field, Stu had txt a pic of his bag to the farmer, the farmer didnt see it until yesterday. The farmer decided to ring Stu, the conversation went like this, Hello Stu, Hello Spencer I am in Thailand, the phone promptly went dead. Motty, a bit like hedgehogs, is finally out of hibernation. My dog has a habit of looking like a pillock. It was a lovely, sunny day. I think you are correct. If the pigeons had come in nicely, it could easily have been a double century. Never mind. Spencer does make me laugh! Had a look at the field at 5-10pm this evening, I think tomorrow or monday at the latest will give one more big bag day. Cracking days shooting well done, as you say a brilliant result following on. You obviously haven't lost the nack. Thanks for posting and Mungler thanks for the picture. My pigeons are mostly sold to game dealers. Half of that bag are currently in my fridge and freezer. Thanks. I have been doubting my shooting technique, lately. I have been missing birds that I would normally shoot blindfolded. This has been very frustrating. I think I have put my finger on the problem, and will work to eradicate the flaw. I have never suffered such a severe lack of confidence in my technique before. The ‘problem’ may simply be that you haven’t been out decoying much of late. Many decoyers would like to shoot as badly as you do. 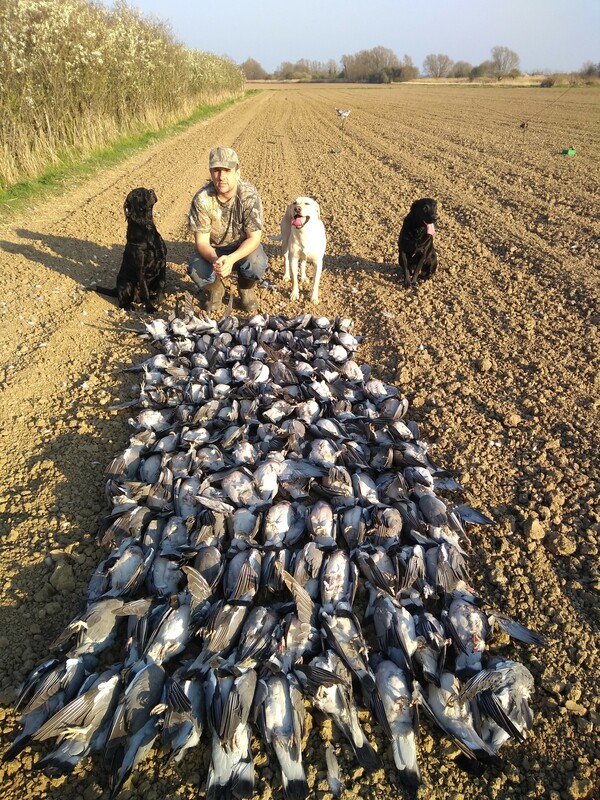 Could well be do to a number of problems , as Mr JDog mentioned about the long lack of pigeon shooting , although with you continuing to shoot wildfowl and maybe the odd day game shooting when the pigeon ( season ) comes to a close I wouldn't think that would make to much difference to your recent lack of form . Could it be swapping guns and chokes for the different species you go after instead of using the same gun for most species . ? When using a three shot auto are you thinking about trying to get a triple when more than two pigeons comes into the decoys ? resulting in rushing the first two shots ? Last Summer I hit a bad patch ( excuse the pun ) during the hot spell , I had bought a load of cartridges off a member , nothing wrong with the cartridges , it was me trying to fire 32gms with just a thin shirt on and it got to the stage where I was flinching when pulling the trigger in anticipating the recoil , once I found out the problem I had a few slabs of Hull Super fast 28 gms , these were ideal and I soon got back to my way of shooting and kept the heavier loads for later on during the year when I could wear more clothing . None of the above might be nothing to do with your recent problem , but it could well be something you might never consider with it being the culprit . You make some valid points. I do use different guns etc, but haven't struggled for form like this before. The clothing issue also makes little difference to me. I believe my problem is my actual swing technique. I feel I can cure it. Lovely job Motty, glad to see you back on winning ways.....130 is a great day regardless of how they decoyed, I bet you enjoyed it more than usual after a break!! We all have off days and its in your head usually, as your aware we shoot as a team and if one of us is having a bad day the other supports. DB has a concern with frozen finger at times and I cover the shot , my nemesis is crows and I will put two shots up and he will hit at what I would term " out of range" . Practice makes perfect so just keep doing it.